Filed under chip on August 07, 2016. A key feature of the C.H.I.P. is the 4Gb onboard flash memory. Unlike a Raspberry Pi, the C.H.I.P. does not require a microSD card (making the cost to operate a C.H.I.P. even less than a Raspberry Pi). You simply connect the C.H.I.P. to your computer and “flash” the C.H.I.P. operating system. Once flashed, you don’t even need a monitor or keyboard to begin using thanks to Next Thing Co’s foresight to include a USB On-The-Go (OTG) connection. USB OTG on a Windows box using Putty is documented online; however, I’ve yet to find specific details on how to make this connection on a Mac. After several failed attempts, I was able to make a USB OTG connection using my Mac. This post documents my process. Navigate to the C.H.I.P. Flasher page at: http://flash.getchip.com/. 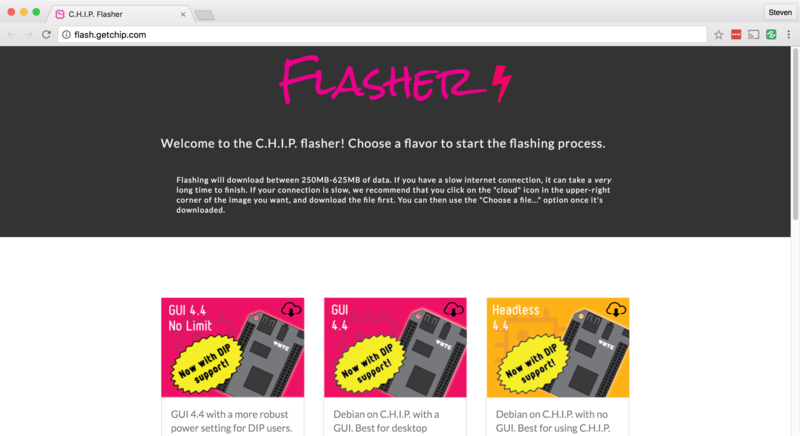 Chrome will prompt you to install the Flasher application. TIP: If you don’t have a jumper wire, you can use a paper clip or a pipe cleaner. Use a microUSB cable and plug the micro connector into the C.H.I.P. and the standard USB connector into the Mac. It will take awhile, so kick back and relax as you contemplate the wonderful things are are going to do with your $9 computer. 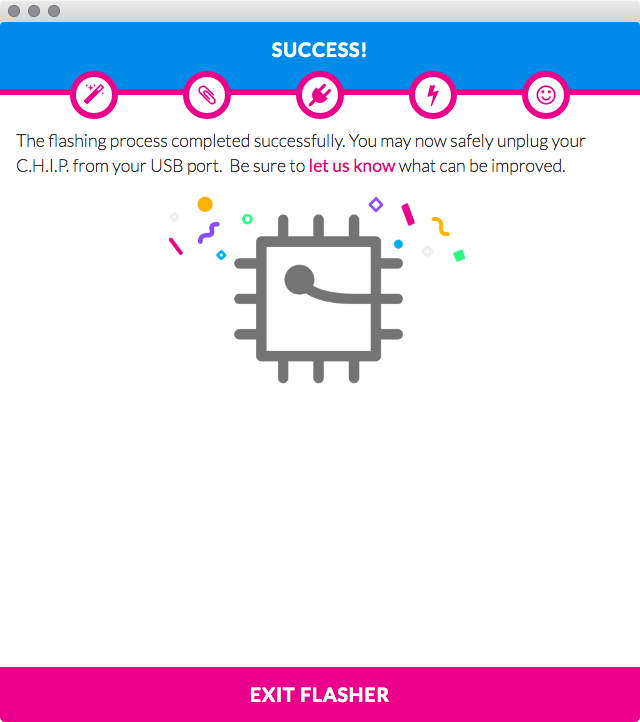 Once flashing is complete, click the EXIT FLASHER area at the bottom of the dialog box and unplug the chip from the USB cable. Remove the jumper from pins REL and GND. Reconnect the C.H.I.P. to the Mac without the jumper. The C.H.I.P. will begin the boot process. 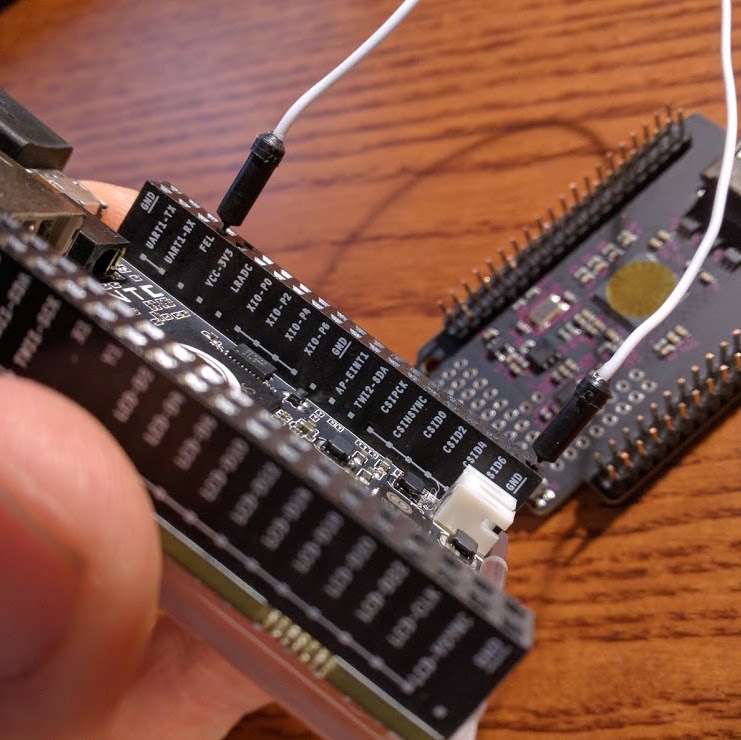 The use of a serial connection is baked in by the developers and is a very cool way to connect your C.H.I.P. to your home Wi-Fi and begin using your C.H.I.P. immediately. Let’s get to the fun stuff now. This is a bit tricky, so follow closely. 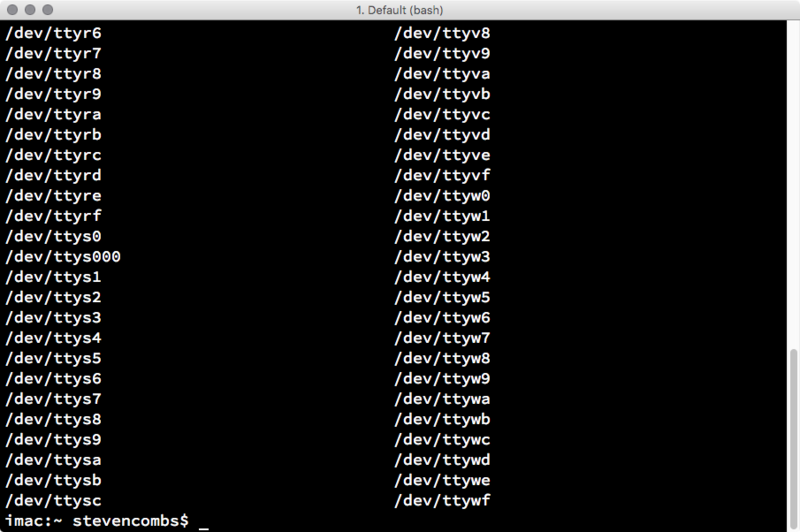 Load the Terminal application on the Mac and issue the command below. The Mac has a serial connection command built-in called screen and we will use the screen command to make a serial connection to the C.H.I.P. so we can issue commands on the C.H.I.P. The 115200 (115,200bps) at the end of the command is the connection speed between the Mac and the C.H.I.P. Once you do these two things, you can untether your C.H.I.P. from your Mac and administer it remotely. If you see the name of your Wi-Fi network (along with others depending on the proximity to your neighbors), you are ready to make a connection. Remember to make the substitutions to include your Wi-Fi SSID and password. The C.H.I.P. will ask for a password. This is the C.H.I.P. user password, chip, not the Wi-Fi password. You will type blind and will not see the password or * placeholders. Success! The C.H.I.P. will remember the Wi-Fi connection even after a reboot. Now determine the C.H.I.P. IP address so you can untether the C.H.I.P. from the Mac and make a remote connection via SSH. 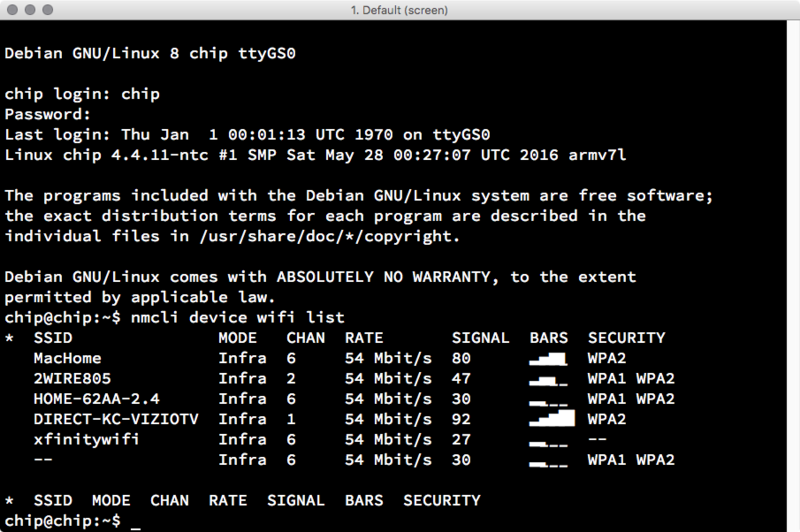 TIP After I wrote this post, I discovered a visual way to configure the Wi-Fi network. Issue the nmtui command and you will see a terminal “blue-box” that will guide you through this process using a terminal dialog box. Pretty slick. The C.H.I.P. will display IP information. Look for your local network IP range and write it down. At this point, I recommend you also write down the MAC address of the device. The IP address will likely change if you reboot your device often. I recommend you configure your Wi-Fi router so it receives the same IP address each time the C.H.I.P. connects to the network. You should be able to find instructions for both of these tips with a quick Google search. Leave the C.H.I.P. plugged into the Mac and connect via SSH. You can also plug the C.H.I.P. into a power source anywhere in your home and connect via SSH and allow your C.H.I.P. to become a server. 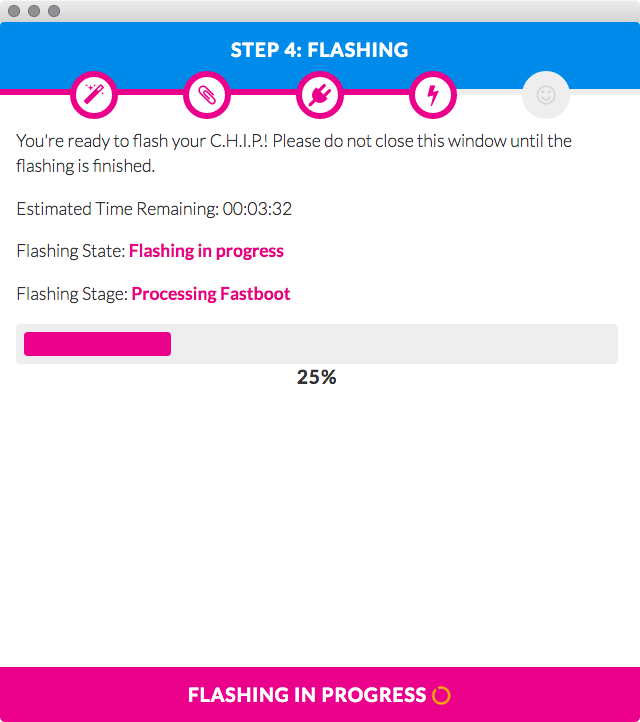 If you flash the C.H.I.P. with a GUI, you can control the C.H.I.P. 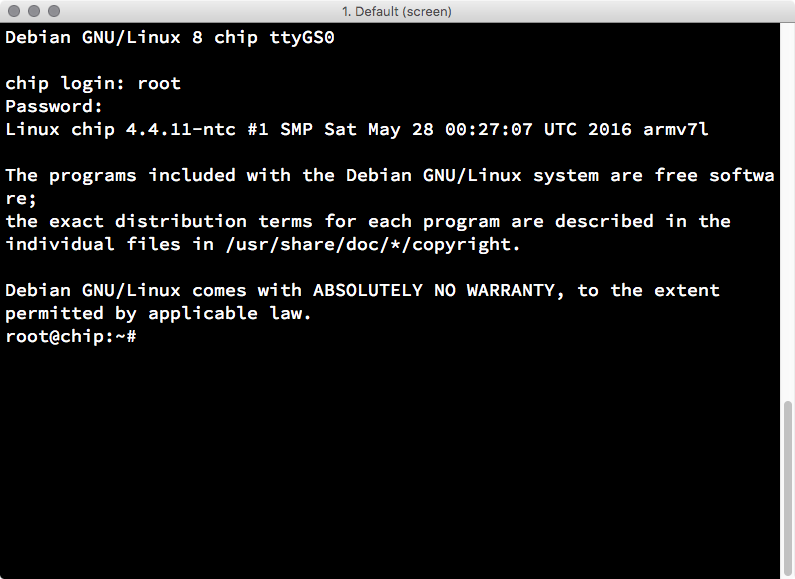 using that GUI if you follow my x11vnc instructions. Let me know if there is an error in my write-up using the comments below. It’s a lengthy post and I may have fat-fingered a step. I hope Mac users with a new C.H.I.P. find this useful. It took me some time and troubleshooting to figure this out, but I learned a lot along the way. What will you do with your untethered C.H.I.P.? I would love to read your ideas. Drop those in the comments as well.